What's so special about a chrysanthemum? The great Japanese director Kenji Mizoguchi's 1939 film promises to be just that. Instead, there's barely a physical flower in sight. Rather than feeling conned or ripped off by this, we simply fail to notice. The story of The Story of the Last Chrysanthemum is just that good; its telling even better. The tale, set just prior to the turning of the twentieth century, is rooted in the Kabuki theater tradition of old world Japan while the male protagonist espouses much terminally modern opinions and attitudes. An ultimately self-serving actor who spends the film questing to better his questionable stage skills, young Kikunosuke (played with desperate, simmering thickness by Shotaro Hanayagi) regularly proposes brash life choices that would threaten the honor of his family or his loved one, Otoku (Kakuko Mori, empathetically torn to the end). Is she the “chrysanthemum” of the title? What will happen if he unearths her? They will run off together, reputations be damned. Five years of suffering as vagabonds is the reward that Kikunsuke and Otoku reap for their actions. In their defense, opportunity knocking on one's door sounds a lot better when basking in the glow of the immediate reverberations. From a distance of time and kilometers, its just the dull thud of knocking on wood. As their shared goal for Kabuki success for him both begins to pay off and cost their forbidden marriage dearly, their life gives way to a kinda-sorta Gift of the Magi scenario. Wide shots rife with depth and slowly unfolding lyricism occur so regularly in this quiet black and white marvel that a cinephile could get spoiled in the world of this director's visual mastery. Mizoguchi, as it's pointed out by film critics Philip Lopate and Dudley Nichols in the Criterion Blu-ray's supplements (which are otherwise sparse), was an ahead-of-his-time perfectionist of the cinema. Today, outside of devoted film buff circles, the world struggles to remember him. It is a sad and tragic twist worthy of one of his own dramatic stories, so many of them detailing the mournful fates doled out to undeserving, mostly female recipients. Yet, much in the way that Harold Lloyd rates as “the third genius” of American silent comedy just after Chaplin and Keaton, Mizoguchi is commonly recognized as “the third genius” of The Great Japanese Filmmakers, following Kurosawa and Ozu. Like Harold Lloyd, though, Mizoguchi stands out as the most versatile, landing universally relatable tales of woe that don't lean too far, for some, into Western sensibilities (Kurosawa), or stray too far into Japanese cultural esoterica for nescient viewers. This helps to grant Mizoguchi's work a certain timelessness, a cultural anchoring that plays wider. Just as Mizoguchi himself is the third genius of his grouping, similar is The Story of the Last Chrysanthemum itself in relation to its fellow great entires by the director. 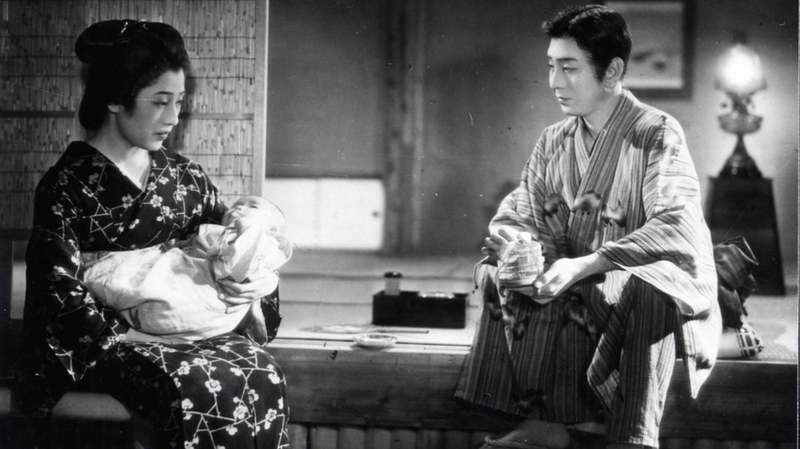 Mentioned, if mentioned at all, just after the filmmaker's considerably later masterpieces Ugetsu (1953) and Sansho the Bailiff (1954), Chrysanthemum has pedaled to a respectable if still fairly obscure place of lofty reknown. It is beyond great to finally have the film on DVD and/or Blu-ray. Considering the film's age and etiology, it's a wonder we have it today at all. The fact that it demonstrates some wear, tear and other occasional imperfections in the video transfer is completely forgivable, if still noticeable. (The same can be said for Criterion's recent release of A Touch of Zen, it hailing from an altogether different country – China – more than 30 years later.) During one particularly astonishing long, low-angled nighttime tracking shot, an apparent exposure issue on the right edge of the frame gives a surreal impression that the characters are walking towards an ever drifting wall of weltschmerz-ian mist. Throughout, there's a sorter-than-usual look and feel to the story. That said, The Story of the Last Chrysanthemum is not to be missed by students of film, screen directing, or for those interested in tales of Japan at a crossroads. (How much longer would Kabuki theater remain a go-to entertainment for the masses?) Students of Japanese cinema already know this. Now, the world can more easily see and acquire as fine a version as possible of another of the major films of 1939. That monumental movie year that also gave us Stagecoach, The Wizard of Oz, Mr. Smith Goes to Washington, Ninotchka, Gone with the Wind, among others. Mizoguchi's The Story of the Last Chrysanthemum was made far away from all of that. It is considered his first masterpiece, and is itself a rare beauty among a garden bed of disposable commonality in his fascistic home country of the time. 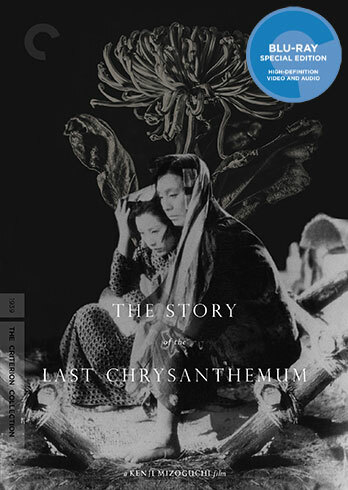 Perhaps Mizoguchi was indulging a certain fatalistic streak by naming his painstakingly realized accomplishment such a thing, but in any case, we can all be grateful that Criterion has finally given this very special flower a new lease on life.